Many languages respect the generalization that some or all unstressed vowels are deleted. This generalization proves elusive in classic Optimality Theory, however. The source of the problem is classic OT’s parallel evaluation, which requires that the effects of stress assignment and syncope be optimized together. 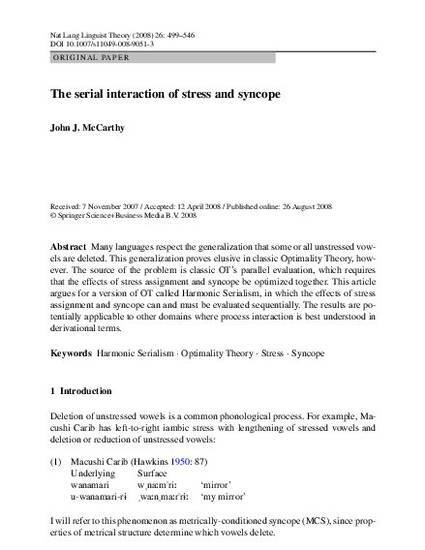 This article argues for a version of OT called Harmonic Serialism, in which the effects of stress assignment and syncope can and must be evaluated sequentially. The results are potentially applicable to other domains where process interaction is best understood in derivational terms.